The gold barb (Puntius semifacciolatus) is actually a color variant of the rarely seen green barb, which some aquarists may also know as the Chinese barb. It should come as no surprise that a fish referred to as the Chinese barb is native to China, and it is found throughout the Red River and many of its tributaries. Because they originate in fast-moving water, any aquarium containing gold barbs should have a moderate amount of current to it. You don’t need to construct a dedicated river tank for them, but some flow – either from a powerhead or HOB (hang-on-back) filter should be provided. If you do want to spend the time and money that it takes to set up a river tank, then you will be rewarded with displays of their natural behaviour in fast-moving water – but for a fish like the gold barb that doesn’t absolutely need it, it’s usually over-kill. While they are technically classified as a subtropical fish, they can tolerate both tropical and cool water tanks. As long as the temperature of the tank is kept close to their preferred range 64-75°F (18-24°C), they will remain both happy and healthy. The gold barb remains small in the home aquarium, and grows to a maximum length of just under three inches(2.8 inches). With that being said, most will only grow to about two inches – especially if they are kept in smaller aquariums. On average, they will live for around three years, but some exceptionally well cared for gold barbs can live up to five years. 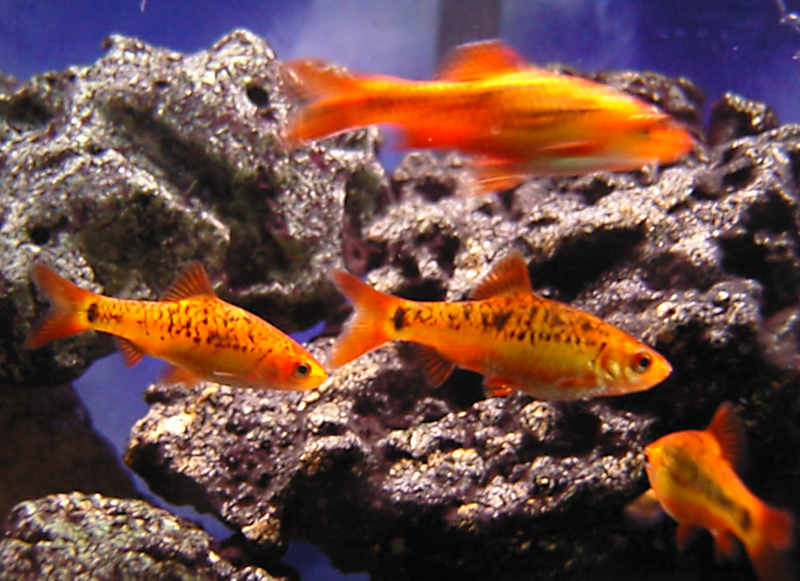 The gold barb is a peaceful and hardy fish, and will do well in most community fish tanks. It’s tolerance for cool water and docile nature makes it one of the few good tankmates for goldfish, although you have to be sure that the water temperature doesn’t fall too low during the winter months (if you live in a northern climate). Because of their small size, they can comfortably be kept in a 10 gallon (38 litre) fish tank, but larger tanks will provide a healthier and more stable environment for them. If at all possible, they should be provided with at least a 20 gallon (76 litre) long fish tank. And as a general rule of thumb, the larger the tank that can be provided, the better it is for the fish in the long run. Like most other commonly kept barbs, gold barbs are a schooling fish and should always be kept in groups of at least five. If they are kept in groups of less than five, they will spend most of their time in hiding and will become stressed – which can eventually lead to illness and death. Keeping them in groups larger than five also has the added benefit of bringing out more of their natural behaviour and making them more active – two things any dedicated fish keeper should strive for with their fish. Since they are such an active fish, there should always be an open space in the aquarium to allow for open swimming. Any plants should be planted in a manner to ensure that a swimming space is always kept open for the gold barbs and should be placed at the sides or at the back – as should any ornaments. When choosing a filter for gold barbs, the best choice is usually an HOB (hang-on-back) filter. The benefits of a HOB filter are two-fold – the first being that they are usually the most economical choice. The second benefit is that they provide some current to the fish tank, which gold barbs benefit from having in their environment. You will often see some of the gold barbs playing in the filter outflow, and sometimes they will even try to jump into the filter. I would strongly recommend choosing an Aquaclear Power Filter for a gold barb tank. This filter combines excellent filtration with a durable design, and it will keep your tank sparkling clear for years to come. You can also read the Aquarium Tidings Aquaclear Filter Review here. 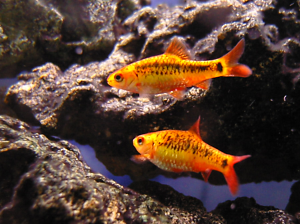 Gold barbs are omnivores in the wild and feed primarily on insects, small crustaceans and plants. This diet should be recreated as closely as possible in the home aquarium, and they should be fed a high quality flake food along with occasional feedings of live or frozen food and a Spirulina based flake or pellet. I personally use Hikari Micro Pellets and in my opinion, it’s one of the best prepared foods on the market. Their favorite frozen foods are bloodworms, daphia, and brine shrimp. When it comes to live foods, they will hungrily devour blackworms, mosquito larvae, daphnia and many others that you can collect outside. With that being said, it’s always best to culture your own live food to ensure that there are no hitchhikers or other contaminants that can be potentially dangerous to your fish. They should also occasionally be fed vegetables, and the only ones they seem to accept are blanched zucchini medallions and shelled peas. You can experiment with other vegetables, but those seem to be the only ones that they show any interest in. If you are planning to breed gold barbs, then a separate breeding tank should first be set up. They are egg scatterers and are more than happy to devour their own eggs and fry. While some fry may survive in a heavily planted tank, the vast majority will become a quick snack for their parents. Before you setup a breeding tank, the fish should be sexed to insure that there are both males and females present. The males will usually have a brighter coloration, while the females have a more dull bronze color. The males will also develop a reddish belly during mating periods, while the females will become more bulky with eggs, which usually makes them both easy to identify. An equal number of males and females should then be placed in the breeding tank, and breeding will normally occur within a few days. The male will aggressively chase the female around the tank and may strike her with his tail, or attempt to push her towards a planted area in the aquarium. Eggs are normally released just as the first rays of light reach the tank, and are quickly fertilized by the male. Once eggs are present in the tank, both the males and females should immediately be removed, as they will eat all the eggs that they can find. Most eggs will hatch with a day or two and after a few more days, the fry will become free-swimming. At this point they can be fed commercially available fry food, or baby brine shrimp.